And here Christine was, reminding me of the same thing! 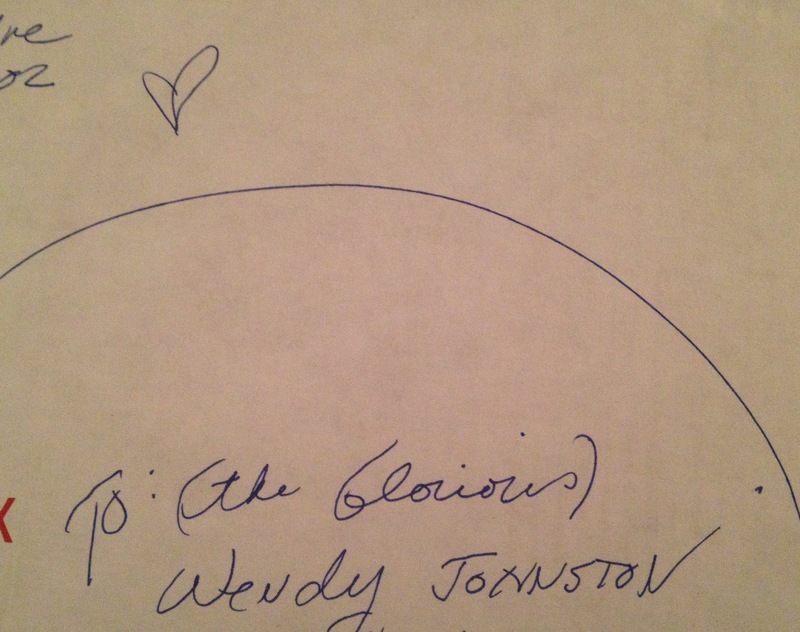 [Take it in, Wendy- the peace, the wholeness, the tranquility]. She also said, “I liked you from the first time that I met you.” I told her I did, too, and that she makes me happy. She is always concerned about the comfort level of anyone around her and goes out of her way to make sure that she greets and connects with everyone who comes into her path. A Chinese woman pulled up into the parking lot, and as soon as she got out of her car, Christine said to her, “Oh! You don’t have a hat! Here, take mine! Would you like to sit with us?”. The woman said that she wanted to walk far down the beach, but thanked her. “Charlie always asks me why I talk to everyone, but that’s ME” she explained. She is delighted by children, flowers, seashells, feathers, the sight of planes, and the sound of birds. “Does anyone in your family like feathers?” she asked as she picked one up from the sand. “Really?”. I don’t know what provoked this good mood, but this was exciting! It was my second time going to a restaurant since the end of the PCT and it happened to be the same one that I went to in May when I visited my friend Jacqui. We had sushi that night and it was SO good! Charlie had heard that this restaurant had excellent fish cakes, and for some reason, tonight was the night he felt like trying them! So, in my dirty jeans, worn out Washington PCT shoes, and my thin rain jacket, we took a drive. I fretted about the things I wouldn’t be able to eat as this was my second gluten-free day. Sushi was out because of the rice. I didn’t even have a bite of the bread they offered before the meal. I had a nice piece of salmon with greens and tomatoes and a glass of the same white wine that Charlie and Christine had. It turned out that this restaurant never offered fish cakes, but Charlie found a nice scallop dish instead. During dinner, I learned that Charlie had attended the same private high school that my father had taught at from the time I was 11 to 17. I lived on the same campus that he had also spent 4 years living on! I also learned that Christine used to work at an art gallery in downtown Boston. Every time that any person who worked in the restaurant passed by our table, she would stop them and tell them what a wonderful time she was having and that this was her first time here. It was obviously something that they were not accustomed to hearing after being pulled aside. I have seen her small gestures of kindness light up the faces of so many people and every time I see her do this, I understand that she is my teacher. The effect we can have on one another is tremendous. 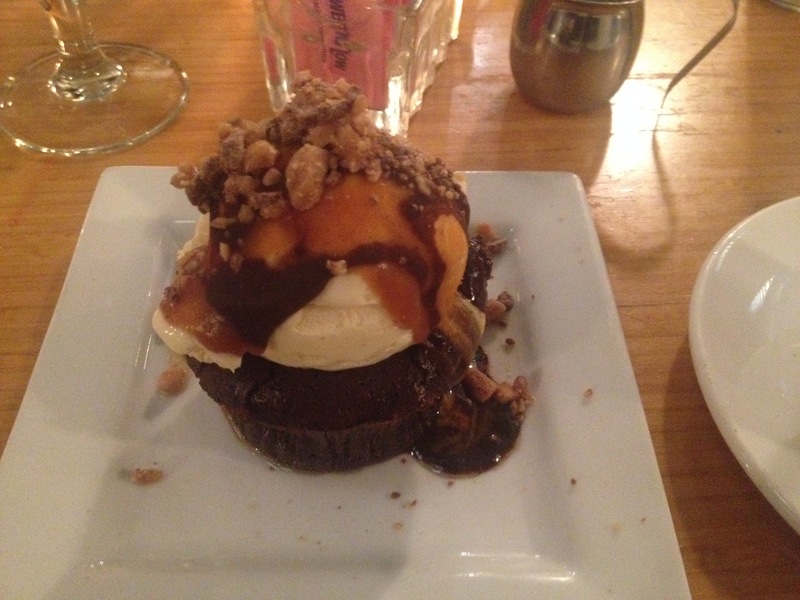 When the waitress came by to ask if we wanted dessert, I was very surprised (even elated!) that Charlie asked for the menu! In my experience, men always turn down dessert and just want to go home! Again, I thought I would have to forgo dessert because of the gluten, but the chocolate cake happened to be gluten free! And what a chocolate cake it was! (Okay, maybe gluten free is not so bad after all!! [Sugar, dairy, and coffee-free is another story…]. I took a picture of my dessert and one of the waiters came by and said he would take our picture together. Charlie said he could take one of me and Christine. Even though Christine and I weren’t prepared to go out, and would have liked to look a bit nicer, we felt so happy on the inside! Christine thanked Charlie numerous times throughout dinner for taking us there. I still feel thankful for this experience, as well! I also received a care package this week (again, something that I haven’t received since the PCT)! My friend, Weeds, posted on Facebook that she had a beautiful magic wand made of copper and crystals that she had inherited from the passing of her dear mother this summer, and that she wanted to let someone else have. I saw this very soon after she posted it and thought that I could use a magic wand (especially at this time!) and that it would be nice to have something physical to be connected with Weeds and her mom. (I didn’t inherit a single item from the passing of my own mother). At the same time, I hesitated for a moment- I didn’t really need to add anything else to the possessions I already have. I ended up writing to tell her I would take it if she could mail it to me. She wrote back and told me that she would LOVE for me to have it! A few days later, she told me that she spontaneously decided to throw a few other things in there for me- a full fledged care package! So exciting! I received it on Friday and what she wrote on the box alone made me feel so happy! The first thing that I pulled out was a book about journaling and its connection to spiritual life! So perfect for me! 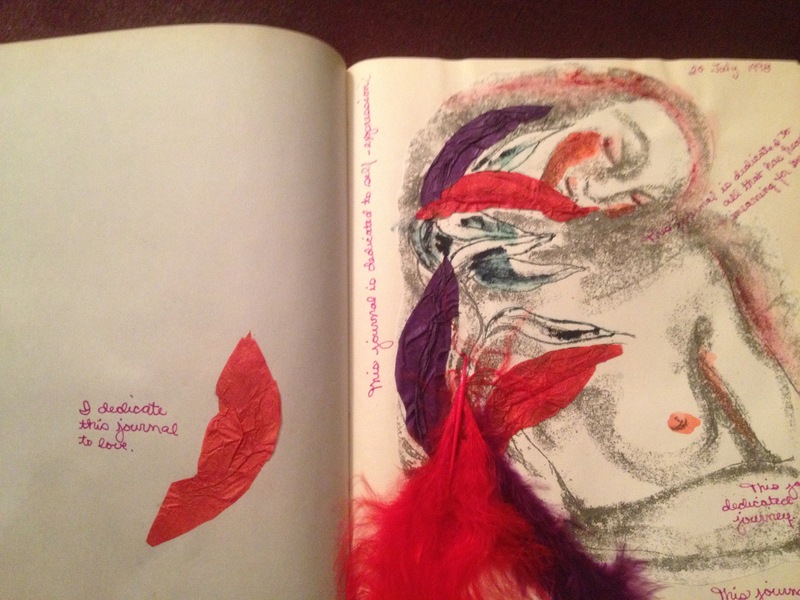 And then, I found the magical lightweight paper journal that may very well only be found in Sedona, Arizona! Weeds had a full sized journal that she carried in her backpack for the duration of her PCT thru-hike, but weighed next to nothing! I was in awe and during my hike, asked on Facebook that if anyone found one, they could send one to me. One friend looked, but couldn’t find anything. I did some research on the internet when I got home and couldn’t find anything, either! And now, I was holding one in my hands! 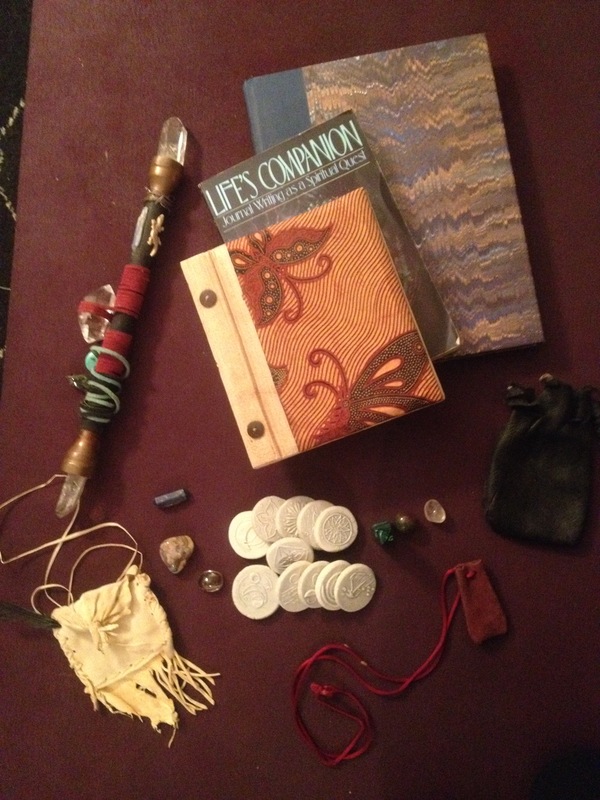 She also sent me some Indian pouches with a few special stones and crystals, and someone’s personal artistic journal! A secret world! This person dedicated her journal to “love” and as I read through it, I discovered that whoever wrote it is a lot like me! Thank you so much, dear Weeds!! I will never forget how she made tea for me in Kennedy Meadows when my stomach was extremely inflamed and in pain and all I could do was lie down. And I won’t forget these gifts ever, either! 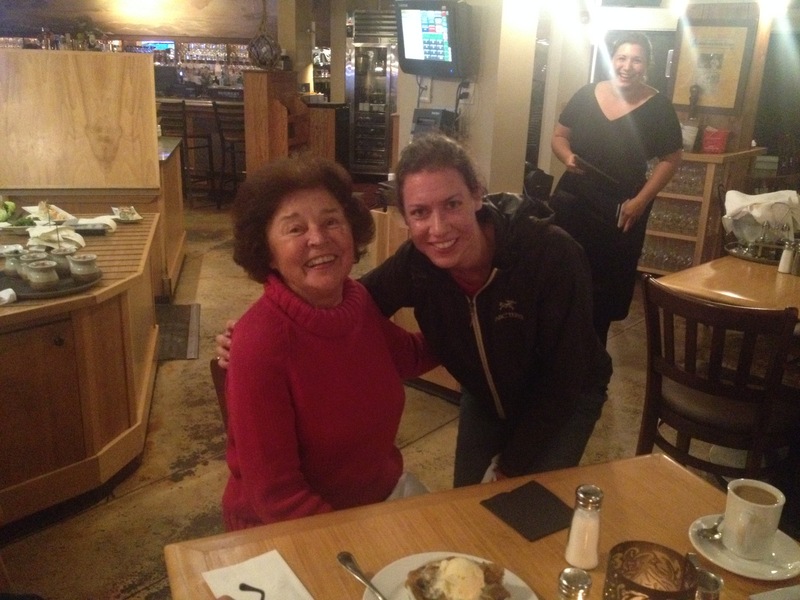 Weeds is such a clever, wise, and humorous lady, and I am so glad our paths crossed on the PCT! I also discovered that I permanently lost a lot of my personal photos last month when I tried to transfer them to my “Time Capsule” because my hard drive was too full. While this is not a happy event (another thing to add to the list of all that happened in September), I am proud of my reaction to this loss. Years ago, I would have gotten very, very upset about this. Now, I am much more calm about losses. It was a day that I had to teach yoga in Cambridge, drive home to go to the dentist, and then get ready to drive to another talk. Somewhere in that time frame, I discovered that my hard drive had only 4 Gbytes of space on it! And my computer was not allowing me to transfer my Quicktime version of my slideshow onto the flash drive I had bought for that purpose! I had to quickly get a lot of stuff off my hardrive. After transferring a lot of photos to my Time Capsule, I deleted them from my computer. Last night, I discovered that the transfer did not work and that only empty folders and blank images exist! (Are you kidding me??) I searched my hard drive for copies, but found no trace of these important photos from my time in Switzerland, on the Colorado Trail, pictures that I got from Truckin’ and a lot of other things that had tremendous value to me). The older I get, the more I realize that you can’t hold onto everything. Life is a process of letting go. And there is great strength in this process. I firmly understand that I have a large data problem that I must act on to find a storage solution for as soon as possible, and while it is upsetting that I will never be able to view these photos again, it is something that I have no control over and must move on from. I have other pictures and other memories. This afternoon, I gave my 15th presentation, and although it was a fairly small audience (I wish I had more input in the publicity part of my talks! ), they were extremely interested in my experiences. It was one of my best deliveries so far and they asked questions for over an hour! I am now excited to give my presentation at my home yoga studio this Wednesday night! Onwards and upwards! Oh- and I will get to see the Dalai Lama for the first time (for several hours!) at the end of next week! Good to read the blog. Wonderful writing. Sorry to hear about loss of pictures. A good way to back up data is with an external HD. 500 GB units can be found for about 50 dollars at Best Buy and Staples. Western Digital is a good brand. I have three and have never lost one. If the computer breaks down, they are not affected. I hope the upward spiral continues for you. The journey was incredible and like reading about it. It is a struggle to find joy and meaning, but the rewards come, even if slowly and they can be long lasting and more rewarding than a more superficial path where comfort, materialism and profit are the main goals. Thank you very much for your advice, Bill!! I appreciate it!